The Good Old Game of Innocence Abroad. 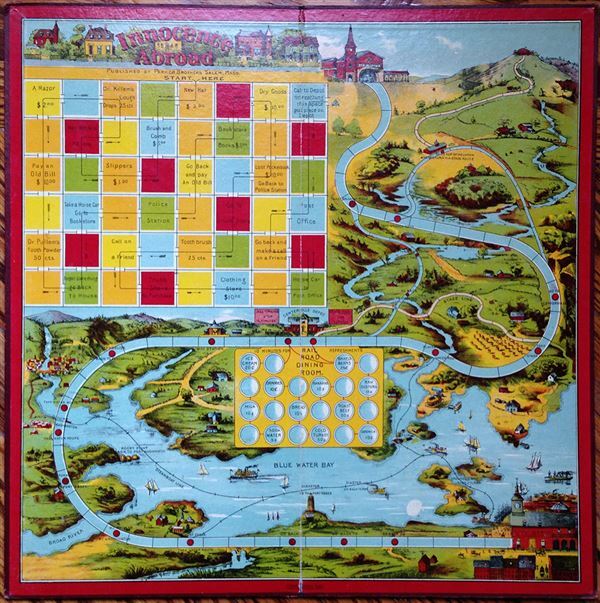 This is a charming and unusual 1888 board game by the Parker Brothers. This game, titled Innocence Abroad, was the first game produced under licence by the Parker Brothers. It consists of a game board with a fictitious stylized map, where players must start from one Ã¢Â€Â˜depotÃ¢Â€Â™ and reach the one on the end the fastest. Along the way, they have various detours and shortcuts, and an opportunity to eat in the railroad dining room and shop in the shopping area. The title of the game is apparently based on Mark TwainÃ¢Â€Â™s 1869 popular book The Innocents Abroad or the New PilgrimsÃ¢Â€Â™ Progress and was the first game to be advertised for sale in a newspaper. This game is copyrighted to 1888 and published by the Parker Brothers, Salem, Massachusetts. Very good. Edges and centerfolds show minor wear. Mounted on thick board. Some foxing at places.